Use to protect new or weathered wood from water damage, including splitting and warping caused by water absorption. 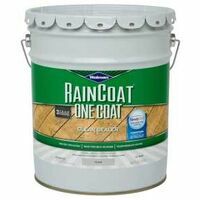 Use as a final finish or water repellent primer under an oil-base paint or stain. Adds water repellency. Suppresses mildew staining. Lets moisture escape while preventing water penetration. Allows original wood color to show through and gray naturally. 3-part water repellent system; Gives immediate water protection and beading, helps stabilize and slow moisture release, and provides long term resistance to water penetration. Covers approximately 150-350 sq. ft. per gallon. Coverage depends on type of wood. Use on decks, fences, outdoor furniture and exterior wood. Prevents water damage. Helps maintain wood's natural color. Coating resists mildew and UV damage. Exceeds industry standard ASTM D-446. Covers about 200 to 400 sq ft per gallon. Can be applied by paint pad, brush, sprayer and roller. Use on decks, fences, outdoor furniture and exterior wood. Prevents water damage. Advanced polymers provide fade resistant color. Coating resists mildew and UV damage. Applies to freshly cleaned damp or dry wood. Exceeds industry standard ASTM D-4446. Covers about 150 to 400 sq ft per gallon. Can be applied by paint pad, brush, sprayer and roller. 2 hour dry time. Designed to provide protection against water damage and mildew. Use to beautify and protect wooden decks, railings, fences and more. Colorless which allows the wood?s original color and grain to show through while protecting the surface from water damage. Includes NeverWet hydrophobic technology with water repellency helps maximize resistance to wood cracking, checking, splitting and warping. Suitable for use on all types of pressure treated lumber, Cedar, Redwood, Poplar, Hickory and other North American hardwoods. Designed to provide protection against water damage, UV graying and mildew. Use to beautify and protect wooden decks, railings, fences and more. Beautifies wood with sheer natural wood-toned color, which allows the wood?s character to show through while protecting the surface from water damage. Includes NeverWet hydrophobic technology properties and water repellency helps maximize resistance to wood cracking, checking, splitting and warping. Ready for use in 48 hours. Mildew resistant coating. Coverage: up to 250 sq ft per gallon with one coat. Deep penetrating waterproofer, combined with dual-action UV protection and a mold, mildew and algae resistant coating. Covers approximately 100-250 sq ft per gallon. A semitransparent stain and sealer in one. It is a unique blend of oils, quality resins and finely ground pigments that penetrate deeply to protect and preserve the wood from the elements. Effective on all types of wood on premium-grade lumbers, including western red cedar, douglas fir, cypress, spruce and redwoods.